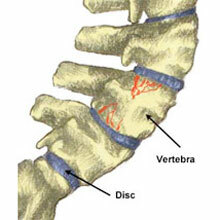 Back pain can be either acute or chronic. Acute back pain can come on suddenly from a specific incident or injury and is particularly painful, or it can be chronic, long-term back pain. Mild or moderate low back pain can be from a chronic or long-term back problem or can follow a bout of acute low back pain. It may be difficult to diagnose a specific cause of long-term low back pain as a number of structures can cause or contribute to the pain. Getting good professional advice to diagnose the cause of the problem is a good point to start along with doing everything in your power to reduce painful symptoms. Read more on gradual onset back pain. Acute low back pain usually comes on suddenly from a movement, such as bending over or twisting as is more ‘acutely painful’ than more long term chronic back pain. It may often result from a chronic or long-term back injury which flares up worse from time to time or could be from a specific incident which has caused a muscle strain, ligament sprain or injury to other structures in the back. Immediate first aid is to get the patient in the most comfortable position. If a muscle strain or similar is suspected, or for any swelling or bruising then apply cold therapy and compression to the area. Read more on acute low back pain. Upper back and neck injuries are relatively rare in sport and most often occur from activities of daily living, such as waking up with a wry neck (torticollis). Neck injuries that are sustained in sport must be taken very seriously, especially if they are associated with symptoms of a concussion or referred pain into the shoulders and arms. A stiff neck is a common complaint which will probably affect everyone at some point in their life. It is, however, usually short-lived, lasting for just a few days at a time. More often than not a stiff neck is caused by muscular tightness. Cervicalgia is a pain in the neck which does not radiate outwards (or down the arms). Cervicalgia is slightly different from a neck strain, which is usually more short-lived. Many causes of upper back and neck pain are work-related, particularly if you spend long hours sitting in front of a computer. Good posture is essential along with regular exercise to prevent neck pain. Read more on neck pain. Prevention is always better than a cure. Avoiding back pain is not just about correct sports technique, but managing all aspects of your life with respect to back care. In particular, this includes back pain when driving, at work, posture, inversion therapy, and kinesiology taping for the lower back. Sitting for long periods in cars is not good for the back, so getting the right seat position and making frequent stops can help. Posture at work is probably one of the most important aspects to consider, not just for upper and neck pain but the lumbar region of the spine as well. Read more on preventing back pain. Back pain can result from a number of causes. Many are muscular or ligament injuries, but there are other specific injuries which can be diagnosed. These include Sciatica (which is a symptom, not an injury), Slipped disc (prolapsed disc), Sacroiliac joint pain, Spinal compression fracture, Paravertebral & gluteal trigger points, and Iliolumbar ligament sprain. Most back injuries will settle with appropriate rest and treatment, however, some require further assessment. Read more on low back injuries.